After reading the introduction and first chapter of Jeremiah, I feel a brotherly affection for the “weeping prophet”. I too, weep for family and close friends who don’t want to come to bible study because they are too busy, or feel its “not for me”. Those of us who feel that we are good enough or better than the next guy. I don’t want to feel that I am better than anyone. Ever. An [inflated] EGO is just the acronym for Easing God Out. I encourage my friends and family to gain a deeper understanding of Christ from time to time. I truly believe that learning more about Christ, in turn, allows us to learn more about ourselves and how we relate to the rest of their world. However, with my toughest compadres, I am often met with contempt and even anger. In these times, I return close to home to protect myself and my family from any negative reactions. It has happened so many times. In the end, though, I can only look at my own heart. And with each passing day, after another scriptural lesson, I know that I am called to do God’s work. After starting a morning in bible study, prayer, worship and contemplation, God brings people into my life who are seeking Him. I find it fascinating that what I just studied that particular morning or week is exactly the lesson or scriptural reference that someone needs to hear. And I am so honored and humbled that I can be the person God calls to do His work. As I was contemplating His words through prayer in the early morning hours of our vacation, I heard my golden retriever walking around on the first floor. This moment actually struck me out of my prayerful state as this is a rare occasion. All week my sweet canine has had quite a bit of trouble getting to his 12 year old feet on the slippery laminate floor. My husband or I have had to pick up all 86 lbs. of our fluffy canine to get him to his food bowl or to the back door for relief at least 4 times each day. We open the door to the salty sea air enveloped in darkness. Lit only by the occasional front porch or streetlight, the quiet streets lead us toward the sound of the ocean. I removed my shoes and our feet touched the cool, soft sand as we made our way up and over the dunes. The pitch black ocean seeped into my bones and fear stopped me from going any further. I took a seat on a wooden bench at the edge of the beach and faced the pounding waves. With the street and house lights casting a weak shadow past my place on the bench towards the dark ocean, I looked into the loud, vast blackness. I trembled as I looked away and was comforted by a million stars twinkling overhead in the moonless night sky. I was in awe of the beauty overhead. I returned my gaze into the ocean and once again felt fear seep in. But I somehow gained the strength to look directly into the darkness. As the waves pounded the surf, I saw a faint light from a barge out at sea miles away from where I sat. I looked to the left of the deep to search for more light, but only then did I find I was beginning to appreciate the darkness. With each crashing wave, I found the simplistic beauty in its raw nature. I was no longer afraid. The waves are just doing their job. And then I was struck with how my life in Christ resembles this exact moment. God used my sweet canine to remind me what life looks like in Him. My life in Christ is this beach. In the early morning hours of late July. Behind me I have the man-made light casting a week shadow into my life. This represents the good and evils in the world. The shadow created by the man-made world points directly toward the ocean. The tumultuous surf and dark ocean is the ultimate destruction one will face after leading a life without Christ. The harsh death and eternal darkness of not obeying God. But the sand is cool and soft beneath my feet. If I walk along the beach, I know that the narrow stretch of sand runs along the coast for miles. With the ways of the world to my left, and the dark ocean to my right, I will be guided by the stars, aka Christ, until the sun (Son) returns. The beach is the long stretch that separates land and sea, and this path is well planned. It was created thousands of years ago. The path that everyone knows to be real. To. Be. True. This beautiful path has now been laid out before me. 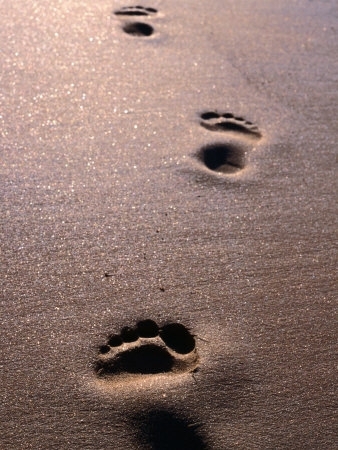 And the sand remains refreshing and soft with each step I take. And the stars will give me strength in the darkness. As the waves pound the beach under the cover of complete darkness, I find that I no longer fear its deafening crash and blackest black ocean. The beach is now in front of me. And even in this moonless night, I can see that it is beautiful. Of course there will be dark days. But I will not fear what is at my right. Or my left. Because I can just look to the stars to lead me home.